Insert a News Blog- and sub page to upload event photos. 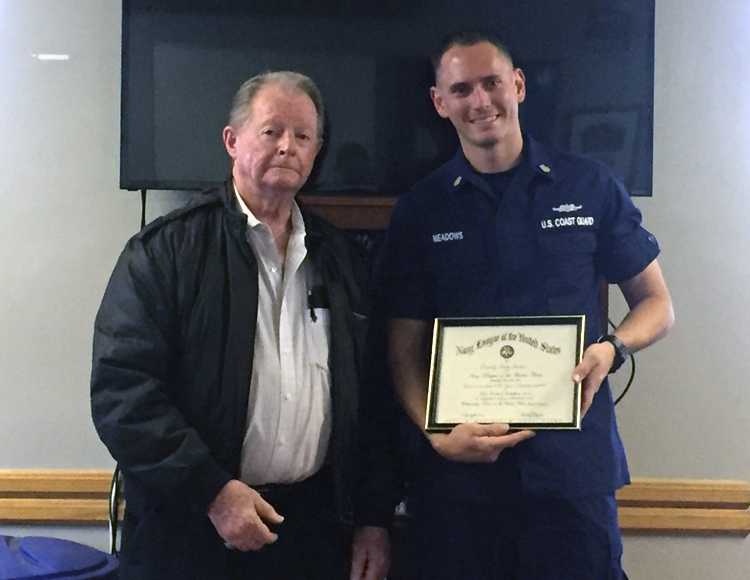 On Wednesday morning, December 28, at USCG Station Marina del Rey the Commanding Officer of the USCG HALIBUT, LT Matt Hurtt called his crew to attention and then proceeded to present his Command’s top honor, Sailor of the (2nd) Half Award 2016 to crewman BM1 Michael Meadows for the outstanding performance of his duties. Complimenting the Command’s Award was the Beverly Hills Council’s NLUS Certificate of Commendation. Representing the Council was Ron Dutton, president emeritus, seen with BM1 Meadows. The Beverly Hills Council has been the HALIBUT’s (and its predecessor…the PT BRIDGE) sponsor for over 40 years. 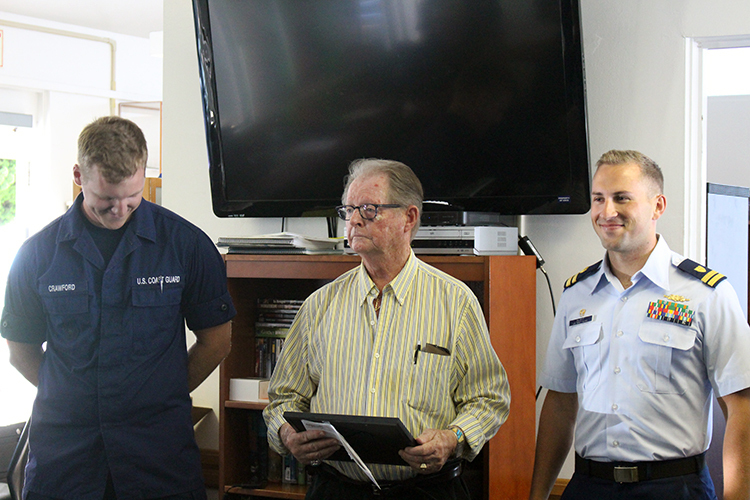 On Thursday morning, July 7, at the Coast Guard’s Station in Marina del Rey, the Command of the USCG HALIBUT awarded its bi-annual Sailor of the Half Award – a recognition of a crewman’s outstanding performance of his/her duties – to SN Joseph Crawford, USCG. Complimenting the Command’s Award the Beverly Hills Navy League Council, sponsor of the HALIBUT, gave SN Crawford a NLUS Certificate, plus a Gift Card. Making this presentation on behalf of the Council was Ron Dutton, BHC’s president emeritus (center), SN Crawford (left) and HALIBUT’S commanding officer, LT. Matt Hurtt (right). At the HALIBUT’s Sailor of the Half Awards ceremony on July 7, a subsequent special Award was made to LT Matt Hurtt, SN Joseph Crawford, and MK3 Chiara Russon, by the Coast Guard’s District (Sector) Command. 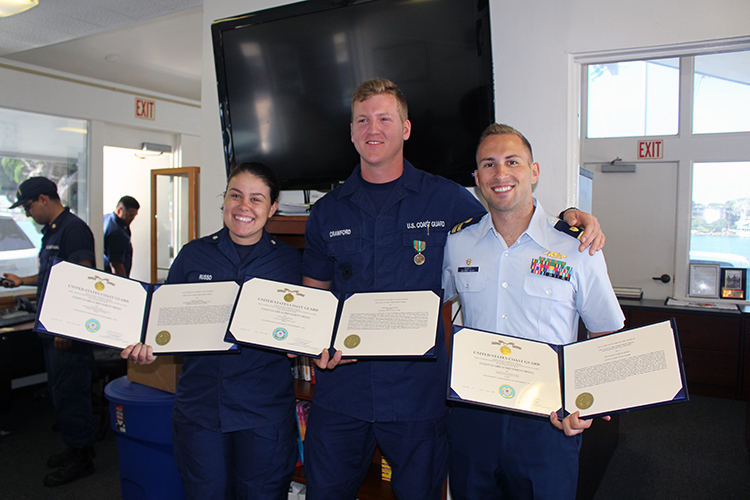 Each was presented with the Coast Guard’s Achievement Medal by the Sector Deputy Commander for their actions which saved the lives of two people who were involved in a highway collision. LT Hurtt and the two crewmen, while driving back to Los Angeles from a training exercise at Port Huemene saw two cars on the side of the highway. Hurtt immediately maneuvered his car to the site of the accident and all three rendered aid and directed traffic until the local first responders could get there. Holding their Citations in the photo are LT Hurtt (right), SN Crawford (center) and MK3 Chiara Russon (left).